Suction Cup Window Ledge. 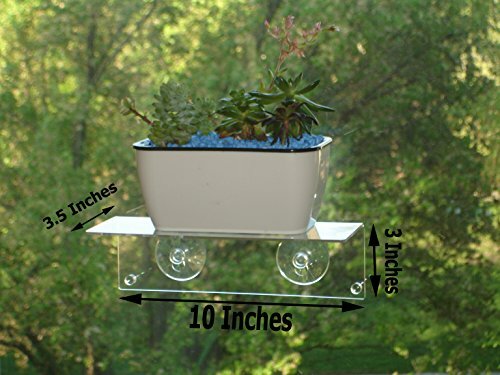 Use Shelf for Succulents, Plants, Herbs, Flowers, Indoor Garden. Multi-use Shelf Perfect for Figurines, Pictures, or even use as a Spice Rack. Use in Home or Office. STURDY: Two Suction Cups and Two Supports that help keep the Shelf from Leaning Forward. Be sure to clean space before hanging using alcohol pad. H4 Includes Insert with Tips for Best Results. PORTABLE: Freedom to move to different areas locations of your choice. Bring Plants to your Kitchen, Bathroom, or Office. UNIQUE SOLUTION: Create Multiple Floating Shelves. Plant lovers now can have them in every room. MULTI-FUNCTIONAL: Besides Plants, use Ledge for Makeup, Toothbrush, Toothpaste, Combs and Brushes, Figurines, Spice Rack...Endless Uses. AVOID Couterfeits: We are Confident in our Products. If for any reason you don't find this useful, please return for a full refund. If purchased from anyone except H4 Diversified, it would not be an original product. If you have any questions about this product by H4, contact us by completing and submitting the form below. If you are looking for a specif part number, please include it with your message.